Parasitoids of wood-boring beetle (Coleoptera) or sawfly (Symphyta, Xiphydriidae) larvae. Brues, C.T. 1924. 1. Some South African parasitic Hymenoptera of the families Evaniidae, Braconidae, Alysiidae and Plumariidae, in the South African Museum with a catalogue of known species. Annals of the South African Museum 19: 1-150. Kieffer, J.J. 1900. Etude sur les Evaniides. Annales de la Societe Entomologique de France (1899) 68, 813-820. Madl, M. 1990. Eine neue Pristaulacus - Art Benoit aus Kenya (Hymenoptera, Evanioidea, Aulacidae). Mitteilungen der Munchner Entomologischen Gesellschaft 80, 85-88. Smith, D.R. 2001. World catalog of the family Aulacidae (Hymenoptera). Contributions on Entomology International 4: 261–319. Turrisi G.F. 2006. 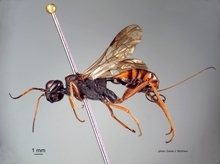 Revision of the Afrotropical species of Pristaulacus Kieffer 1900 (Hymenoptera: Aulacidae). Insect Systematics & Evolution 37: 27-38. Turrisi, G.F., Jennings J.T. & Vilhelmsen, L. 2009. Phylogeny and generic concepts of the parasitoid wasp family Aulacidae (Hymenoptera: Evanioidea). Invertebrate Systematics 23: 27–59. Westwood, J.O. 1841. [Descriptions in entomological society proceedings]. Proceedings of the Entomological Society of London 1841: 535-539. Westwood, J.O. 1844. XXXVIII. On Evania and some allied Genera of Hymenopterous Insects. Transactions of the Entomological Society of London 3: 237-278, plates XIV-XV. Photographs © Simon van Noort (Iziko Museums of South Africa) or © Denis Brothers (University of Kwazulu-Natal) or © Giuseppe Fabrizio Turrisi (University of Catania) and Natural History Museum London.